Discover the new collection of timeless, classic and must-have short down jackets. Women short down jacket is the perfect piece of outerwear for ladies who want to look both casual and smart. The items available in this section enhance your figure and show off your outfit. Hetregó selection of short down jackets ranges from basic and classic items to the cutting-edge ones. 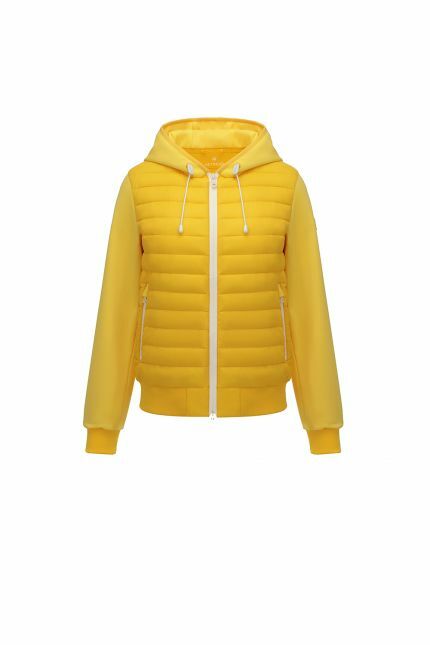 Trendy puffer jackets padded in goose down are the latest fashion trend: oversized shapes in bright colors for a stylish and chic option. This season’s most wearable wardrobe update makes you stand out from the crowd: opt for a true puffer jacket for a sporty and casual look or pick a more futuristic one with side zippers and high collar. Basic light down jackets are easy to travel with and keep you warm without sacrificing style for function. Discover also our timeless pieces made in nylon and detailed with trim hood and refined accessories: you will fall in love with our short down jacket with hood. Down jackets are easy to style as they are versatile and are perfect pieces if you want to base your look on contrasts: wear them with jeans, short or long dresses, sneakers, high heels or pumps. From summer to heavy winter, at Hetregó you can find the perfect short down jacket for any season.